life cycle, from the earliest stages of development to distribution. This case study is based on the 2016 Integrated Report by Sanofi published on the Global Reporting Initiative Sustainability Disclosure Database that can be found at this link. Through all case studies we aim to demonstrate what CSR/ ESG/ sustainability reporting done responsibly means. Essentially, it means: a) identifying a company’s most important impacts on the environment, economy and society, and b) measuring, managing and changing. In its 2016 Integrated Report Sanofi identified a range of material issues, such as carbon emissions, waste management, talent development, business ethics, medicine pricing and innovation. Among these, protecting patient safety stands out as a key material issue for Sanofi. To identify and prioritise material topics Sanofi organised an international stakeholder panel, gathering more than 40 external stakeholders from around the globe, and also set up internal working groups. 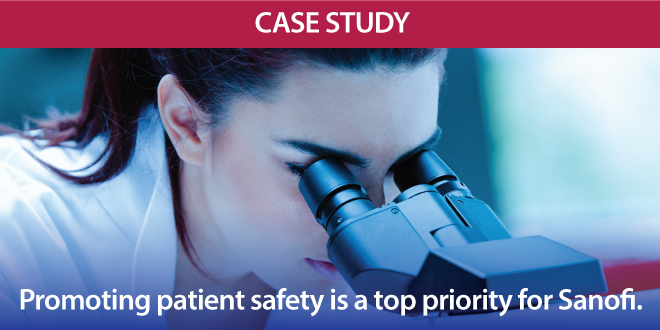 What actions were taken by Sanofi to protect patient safety? Sanofi’s Global Quality vision involves five key areas: quality systems, inspection readiness, quality risk management, quality performance and quality culture. The company’s quality team is dedicated to making sure that products and services provided are fully compliant with all requirements, effective, safe and easy to use. Sanofi uses a mature risk management process, handling quality issues including recalls when necessary, and identifying emerging quality risks, taking measures to avoid them or mitigate their consequences. Sanofi also monitors the quality performance of its own entities and key suppliers or subcontractors through audits, taking appropriate corrective and preventive measures if needed. Sanofi seeks to ensure optimal product security through a number of initiatives. These include controlled transport conditions and anti-counterfeit measures, such as tamper evidence, authentication technologies, and serialisation. In addition, Sanofi makes sure it adapts to evolutions in the regulatory environment and supports digital health software development, while at the same time making sure all applications are compliant with applicable legal requirements. Sanofi’s Global Pharmacovigilance and Epidemiology (GPE) organisation monitors the safety of its products around the globe: prescription medicines and vaccines, consumer health products, generics and medical devices. GPE constantly assesses the benefit-risk profile of Sanofi’s products at every stage of their life cycle to determine, together with the health authorities, the best conditions of their use. GPE also provides physicians, healthcare professionals and patients with complete, up-to-date safety information, including possible risks associated with a product. Additionally, Sanofi’s GPE Department collects pharmacovigilance data from all sources of information, building strong interactions with patients and healthcare professionals globally, during both clinical development and product life cycle management. In this way, it ensures the completeness of the safety data collection process and the effectiveness of Sanofi’s safety evaluations, in compliance with all applicable regulations and policies. Sanofi also makes safety information on its products available through its websites. Disclosure 416-1 Assessment of the health and safety impacts of product and service categories does not correspond to any SDG. Note to Sanofi: With each case study we send out an email requesting a comment on this case study. If you have not received such an email please contact us.